If there is a better way to go about a chase of 278 on a slow, sticky wicket after one opener has been dismissed for a duck, it has yet to reveal itself. A century from - his 112 was the highest score by a Pakistan player on debut - and one from put Pakistan in cruise control of a chase they bossed for the best part of 45 overs. When all that was required was the final flourish, however, their nerves betrayed them. With 49 required off the final seven with seven wickets in hand, the ability to find boundaries suddenly deserted the hosts, the lack of experience finally beginning to show. Imperceptibly, the asking rate crept up on them before they realised what Australia were doing. All of a sudden, the middle order lost their heads as the wickets began to tumble, leaving Rizwan fighting a line hand, thrust into a position he had no business being in. When Rizwan holed out to deep square, the game finished with a whimper, Australia having completed a remarkable heist by six runs. It was just the second time in Pakistan's history they had scored two centuries in a chase, with Rizwan and Abid putting their side in what looked an almost invincible position. They put on 144 for the third wicket - another Pakistani record against Australia, milking the spinners with ease with Aaron Finch running out of ideas even for containment, let alone a wicket. The asking rate and the runs required dwindled as Abid batted like a man who had been in this situation dozens of times instead of one making his debut, while Rizwan at the other end proved to be an ideal supporting partner. Abid's confidence had been apparent from the moment Pakistan came out to bat. Undeterred by Shan Masood's loss off just the fifth ball of the innings, he attacked the Australian fast bowlers from the start. He timed the ball cleanly and was comfortable both sides of the wicket, finding gaps in the infield with regularity and guiding Pakistan out of troubled waters. Rizwan played in the same vein, though as a man in form - this was his second hundred in three games - it was less surprising. He got off the mark with two sweeps off Nathan Lyon that went to the boundary, before taking Finch to task in the over that followed, smashing him for two fours and a six as Pakistan wrested back the momentum that Haris Sohail's wicket had given the visitors. It was after the wicketkeeper joined Abid that the latter slowed down, his innings morphing from a have-a-go cameo into an epic that looked set to win his side the game. Even after a tiring Abid holed out in Adam Zampa's final over, Pakistan never looked in any danger. There was plenty of batting to follow, and the asking rate was under seven. But from that moment, Australia sensed a chance, and a pair of tight overs from followed by two equally impressive ones from Nathan Coulter-Nile saw Pakistan begin to tighten up. Umar Akmal lost his shape completely as Saad Ali fell trying to slog, leaving Rizwan suddenly needing to fetch 16 off the final over; what should have been a stroll was suddenly a cack-handed scramble. Even after he holed out, Usman Shinwari was good for one six over mid-on that briefly raised Pakistan's hopes, but by then, they were raging against the dying of the light. 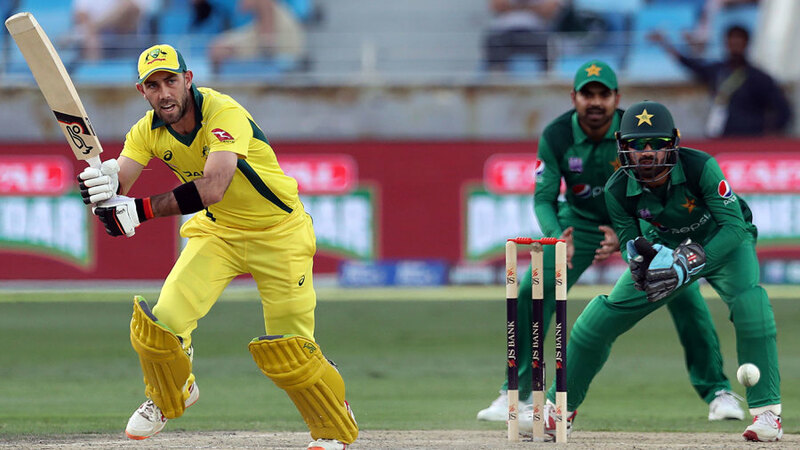 Earlier, a sensational knock of 98 from Maxwell had lifted Australia to 277, 11 more than the score that proved more than enough in the third ODI in Abu Dhabi. He finished two runs short of a well-deserved second ODI career century, while scored a maiden ODI fifty, the pair combining for a hefty 134-run partnership. Usman Khawaja's sensational form continued, his 62 taking him to the top of the leader board among ODI runscorers in 2019. Unlike the previous games, Pakistan controlled the middle overs here, with Yasir Shah enjoying his best game by far. There was even a collector's item - a Yasir googly which actually spun - which undid Marcus Stoinis off just his third ball of the innings. Soon after, he would bring about Khawaja's end as the left-hander looked to sweep once too often and found himself bang in line of middle stump, giving the umpire an easy decision. Mohammad Hasnain brought up his first ODI wicket too. It was the big fish in Finch after the opening partnership had accumulated 56 hard-fought runs, but to say the teenager bowled well would stretch the truth to breaking point. Hasnain was once more all over the place with his lines and lengths, his inexperience showing when the batsmen attempted to attack him. He has both pace and variety, but at the moment not quite the sharpness to know when to use which, and as a result ended up being Pakistan's most expensive bowler. When Khawaja had been dismissed, Australia had lost half their side in 28 overs with the score standing at just 140. Imad Wasim may have been hoping to clean up the visitors for under 200 at that point, with Pakistan perhaps one more wicket away from converting that ambition to reality. The chance presented itself early on with Maxwell on just 10, one ball after he had deposited Yasir over long on for six. It wasn't the sharpest chance, in truth, with the ball taking just a slight deviation from the outside edge of the bat as the batsman shaped to cut. They are the chances Rizwan, or indeed any international keeper, can ill-afford to miss, back-up or first-choice. It wasn't the end of the generosity, however. With the partnership standing at 101, Usman Shinwari cleaned up Maxwell's middle stump, thanks to a furious extra burst of pace. But instead of seeing the batsman walk back to the pavilion, the big screen showed Shinwari overstepping, the resulting free-hit deposited for four through cow corner. It was the extra life Maxwell needed to inflict further damage as he continued to attack without regard for a personal milestone, selflessly run out on 98 with just four balls to spare. It might have been hard to believe the game had yet to witness two three-figure scores at that point, and harder still to accept that the side which scored them would end up second best. The likes of Abid will be better players for the experience, but this won't be an especially good time to tell them that.